For this part we will use the mongoose module that we already have installed, so no updates to the package.json. 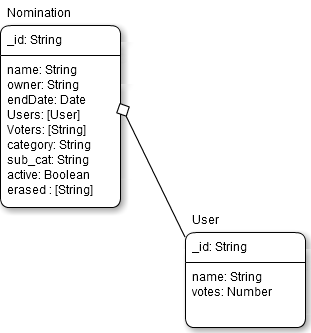 Nomination is our main doc that have all the attributes to create a nomination, this one have a list of users, users its a doc that is embedded in nomination, i put it like this so you can see the separation but its not another doc in mongodb but we need to create the schema definition anyway in mongoose. To add our modules lets create a folder called "models" or whatever in the root path of our app, inside that lets create a file called "nomination.js". 38-41: a small save middleware, before saving a doc of this type, mongoose will first call this function, for this example im not putting nothing yet, "next()" its to call the next function that in this case will be the actual save. Nice, we have our models defined, lets create something to use it, i called it "controller", from there we will handle the mongoose functionality so we are going to expose only whats is necesary. 23-47: Adding votes, lets first check if the user voted its already in the list, if not to added if yes, to add one vote to this victim nominated, we save the model that function will make this change to go directly to the mongodb, lets call the callback to show the results for whom call us, this callback will have as parameters "error" and "doc"